participated on 4 of Roald Amundsen’s expeditions, and he sewed the tent which Amundsen left at the South Pole in December 1911. Martin Rønne grew up in Horten by the Oslo fjord. He became a sail maker by profession and had a workshop in Horten. He was engaged as sail maker on Amundsen’s expedition to Antarctica 1910-12, remaining on the Fram while the shore group wintered at the Bay of Whales and sledged to the South Pole. Amundsen wrote of Rønne’s hard work with his beloved sewing machine on the voyage south, when he sewed sails, shoes, dog harnesses, clothes and anything else necessary. Not least he sewed the small 3-man tent of thin silk that was taken on the Pole trip as a reserve and left at the Pole to be found a month later by Robert F. Scott. Rønne continued to assist Amundsen, joining his next expedition on the Maud through the Northeast Passage 1918-20, and then travelling to Ny-Ålesund, Svalbard, in 1925 to assist preparations for Amundsen’s attempt to ﬂy to the North Pole with the 2 planes N24 and N25. Amundsen described Rønne as ‘the expedition’s busiest man’, working long days preparing shoes, trousers, tents, sleeping bags, boat and sledge details. The following year he was there again, helping to get the Amundsen-Ellsworth-Nobile Transpolar Flight with the airship Norge ready to ﬂy over the North Pole. In 1928-30 Rønne participated on American Richard Byrd’s Antarctic expedition. 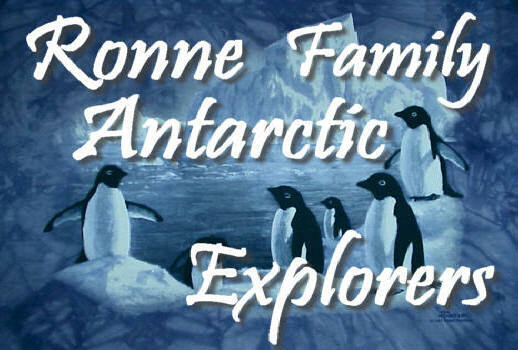 Rønne had 7 children, and his son, Finn Ronne, moved to America, became a captain in the US Navy and became, like his father, famous as an Antarctic expeditioner. Martin Rønne participated on four of Roald Amundsen’s expeditions, and he sewed the tent which Amundsen left at the South Pole in December 1911. Martin Richard Rønne was born on 14 September 1861 in Vang and grew up in Mandal. At the age of 14 he went to sea as an able seaman on various sailing ships, before enlisting as a constable in the Naval Corps in Horten by the Oslo Fjord. He gained petty officer’s rank and moved to the reserve corps, but went off to sea again from 1894 to 1899. On 20 December 1899 his wife, Maren Gurine Gulliksen, gave birth to a son Finn. Finn Rønne (1899-1980: called Ronne in the US) became a US citizen in 1929 and a famous Antarctic explorer in his own right. Martin Rønne was now nearly 40 and he took up the profession of sail maker at the naval shipyard Karljohansvern in Horten. Roald Amundsen met him here when Amundsen started experimenting with man-lifting kites and Rønne sewed sails and a kite chair for the experiment. Being small and light, Rønne was also used to test fly. When the Fram was being fitted out at the Horten shipyard in 1909, Rønne was contracted for Amundsen’s (arctic) expedition with the responsibility for all the sailcloth equipment for the expedition, such as dog harnesses, windproof trousers, anoraks and gloves, dog-sledge covers and tents. Not least he sewed the small three-man tent of thin silk that was taken on the Pole trip as a reserve and left at the Pole to be found a month later by Robert F. Scott and his men. The diaries of Amundsen and the others on the Fram on the voyage south relate how hard Rønne worked at his sewing machine while the ship rolled uncomfortably and the over 100 dogs and puppies bumped around his legs. Rønne remained on the Fram for the oceanographic cruise while the shore group wintered at the Bay of Whales and sledged to the South Pole. Rønne returned to his sail making, now as a town hero, but continued to assist Amundsen, joining his next expedition on the Maud through the Northeast Passage 1918-20. After two winterings through the Passage he asked to leave for home when the ship arrived in Nome, Alaska in 1920. In 1925, however, 63 years old, he again agreed to help Amundsen, travelling to Ny-Ålesund, Svalbard, to assist with the preparations for Amundsen’s attempt to ﬂy to the North Pole with the two flying boats N24 and N25. Amundsen described Rønne as ‘the expedition’s busiest man’, working long days preparing shoes, trousers, tents, sleeping bags, boat and sledge details. The following year he was there again, helping to get the Amundsen-Ellsworth-Nobile Transpolar Flight with the airship Norge ready to ﬂy over the North Pole. Here in Ny-Ålesund he met American Richard Byrd and agreed to participate on Byrd’s first antarctic expedition 1928-30. Rønne then helped pave the way for his son Finn to join Byrd’s second expedition 1933-35. Martin Rønne was involved in the preparations for Byrd’s second expedition when he died on 15 May 1932. He was cremated in Bergen and the urn was interred in Horten churchyard. Rønne had six other children in addition to Finn. A small street in Horten has been named after him: Martin Rønnes gate. Finn Ronne was just 9 years old when his father, Martin Rønne, was selected by Norwegian Explorer, Roald Amundsen, to go on what everyone supposed would be a mission to attain the North Pole. Like all inquisitive small children, Finn and his brothers had always been fascinated by their father's detailed stories of his numerous adventures at sea. From his very first trip, until his death some 60 years later, the ends of the earth had a magnetic pulling force on Martin Rønne. He became a veteran of high latitudes in both the Arctic and the Antarctic. For twenty years he remained the constant companion of Captain Roald Amundsen, that great explorer who became the first to reach both the North and South Poles. Martin Rønne was born with a sea-faring background. His grandfather, an English sailing master and ship-owner, who had settled at Mandal in southern Norway, took him along on summer cruises to the North Sea and Baltic ports when Martin was only eight years old. With the curiosity of the very young, he watched the sailors every move. He knew the ship from stem to stern, climbed the rigging and the yard-arms and observed the heavy planking on the ship's side. Far out on the bow-sprit, he dreamed of a day when he also might be on a sailing ship making long voyages to distant lands. By the age of thirteen Martin Rønne was ready for a career on schooners and barkentines trading in ports all over the earth. His seamanship was learned long before radio, diesel, or radar were integral parts of ships plying the world's oceans. In an era when it took iron men to handle wooden ships, he used the mariners sextant, memorized the points on the compass rose and knew the name of every sail, running line and fixed stays on the most complicated full-rigged sailing ship. After three years at sea, he returned home as a full-fledged sailor before his seventeenth birthday. Schooling for his ticket as a navigator was followed by military service in the Navy and then many years of criss-crossing the world's oceans in Norway's merchant marine. When barely forty years of age, he retired from the sea and settled down ashore in Horten, the home port of the Norwegian Navy. But not for long! In 1908 when Roald Amundsen, fresh from his conquest of the North-west Passage, came to the military establishment in Horten to select men for his forthcoming North Pole expedition, Martin Rønne was interviewed by the world famous explorer. As a result of their first meeting, Amundsen selected Martin Rønne as a member of his FRAM expedition in the capacity of sailmaker. The modest size of his ship FRAM limited the expedition's complement to a total of eighteen men. Therefore, the more trades a man knew, the more valuable he would be. Each man was specifically chosen for his capabilities, seamanship, efficiency and personality as a member of the team whose aim was to be first to reach the North Pole by ship. Rønne's height was 5’-8” and he weighed about 160 pounds. He was wiry and hard as a nail which contributed to his additional assignment as the expedition's aerial observer. While the usual method of piloting a ship through the pack ice was from the crow's nest on the foremast, Amundsen thought it would be helpful to observe the pack ice ahead from a much higher vantage point. He introduced box-kites. Ten to twelve of them attached to one another were able to carry a man aloft to a height of 300 meters. An observer standing in a light canvas-covered frame could guide the ship through the open leads in the ice, much as our helicopters assist our icebreakers today. On the small island of Vealos, outside Horten, Martin Rønne trained daily and made numerous assents during the summer of 1909. As a special attraction at the exposition at Aarhus, Denmark, he was sent down with the numerous box-kites and demonstrated his aerial exploits before thousands of wide-eyed visitors. Amundsen hoped this would be a strong boost to their quest for the North Pole, and the experiment received acclaim all over Europe before the expedition sailed. Some 50 years later, in the Jubilee issue of the History of Norwegian Aviation, Rønne is mentioned among the early pioneers. The expedition intended to sail around Cape Horn, South America, proceed north to San Francisco, enter the North Polar basin through the Bearing Strait and start their drift with the current that would carry them over the North Pole to the waters east of Greenland. Amundsen's plan was based on Fridjof Nansen's original idea, but fate intervened. In the summer of 1909, world headlines announced that Robert E. Peary had succeeded in his final attempt to reach the North Pole. Secretly, Amundsen altered his plan and decided instead to be the first to reach the South Pole. The English explorer, Ernest Shackleton, had come within 97 miles of it the year before (1909); and now in the summer of 1910, another Englishmen, Robert Falcon Scott was on his way to New Zealand, ready to head south and establish his wintering quarters at McMurdo Sound in the Ross Sea. 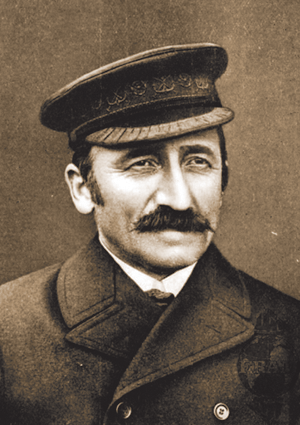 When the FRAM reached its last port of call at Funschal on the island of Madeira, Amundsen broke his self-imposed silence, announced his change in plans, and sent a cable-message to Scott, “Am heading south,” thus informing him that he had a competitor in the race for the South Pole. On the deck of the FRAM, Amundsen called his 18 men individually by name and offered each a chance to reject the change in plans and a free passage back home. Along with every other man, Martin Rønne accepted the new challenge. They broke contact with civilization and set a course for the south-polar continent, whose outline was still 90% unknown. Amundsen's wintering party of nine men was established in the Bay of Whales, a small indentation in the Ross Ice Shelf that was first seen by Ernest Shackleton three years earlier. FRAM then returned to Buenos Aires, Argentina, for the winter. The 10 men onboard, including Martin Rønne, made an oceanographic cruise of several months duration in the South Atlantic Ocean. Their enthusiasm was boundless when they learned that Amundsen and four sledging companions, using dogs as pulling power, had reached the South Pole on December 14-17, 1911. The small silk tent which Amundsen raised to mark man's first attainment of the spot designated on maps as the South Pole was made by Martin Rønne. He had foreseen that the pole party would reach their goal and was the first to congratulate the five men as they stood in the center of the 9,800 foot high desolated KING HAAKON VII PLATEAU which surrounds the South Pole. Amundsen wrote his account of the incident, “. . . the tent was made by our excellent sailmaker Rønne and was made of very light material. When everything was arranged inside the tent, we made, one at a time, a trip inside to write our names on a tablet that was fastened to the tent pole. On this occasion we received our comrades wishes and congratulations with our good results, because on some of the yellow leather straps that were sewed to the tent under the supporting lines was written: ‘A lucky journey and welcome to 90 degrees south.’ These good wishes that we suddenly discovered, pleased us very much. It was signed by Beck and Rønne. They had good faith in us . . . ” On the leather straps were also inscribed the names of Martin Rønne's family in Horten. Beck was the ship's ice-pilot and a very close shipmate of Rønne. Robert Scott and his four companions found this tent one month later, in January 1912, but unfortunately, on their disastrous return journey, all five of these gallant Englishmen perished within 11 miles of their largest food cache. News of the tragedy did not reach Amundsen until the FRAM arrived in Argentina many months later. The expedition members returned to Norway where many honors were bestowed upon them; and a well earned rest was enjoyed during the summer of 1912. But, as Amundsen had pointed out, only the first half of the plan had been completed. Most of the men who had been on the South Pole venture decided to remain at home, but Martin Rønne, along with three other veterans, volunteered to continue with Amundsen on his original objective - a drift by ship across the North Polar basin. In 1913, they returned to Buenos Aires and rejoined the FRAM, which had remained docked there. Rather than proceed around Cape Horn, the FRAM, which had sailed further north (under Nansen) and further south than any other ship afloat, was offered the honor of being the first ship to sail through the Panama Canal, scheduled to open for shipping in the Spring of 1914. Land slides in the canal delayed its opening, so after many months of idleness in Colon, Panama, the FRAM’s course was again set for Buenos Aires. Amundsen decided to sail the FRAM around the “horn” anyway. During their return voyage to Buenos Aires, Martin Rønne was grief-stricken by the death and burial at sea of his close friend Andreas Beck. As he was restoring equipment in a locker room one day, Rønne also discovered that the thick sides of the ships hull-planking had started to rot. With his bare hands, he was able to force his arm through heavy wood above the waterline where the planking had disintegrated. After a thorough ship's inspection in Buenos Aires, it was determined the FRAM was no longer sea-worthy. Thus the second phase of Amundsen's original plan had to be postponed indefinitely until a new ship could be built. It took the FRAM 99 days to sail from Argentina to Martin Rønne's hometown of Horten, Norway, where they arrived just as the First World War began (during the first days of August 1914). The outlook for a new ship of the type that Amundsen had in mind did not appear hopeful. The achievements of those gallant men who stood on the deck of the FRAM in the harbor of Funschal and unanimously gave their loyalty to their leader, will live forever in the annals of polar exploration. In their honor, no more fitting monument could be erected by the Norwegian people, through the generosity of Lars Christensen (a shipowner whose whaling factories often plied Antarctic waters), than the restoration of “polarskibet” FRAM as a museum with their names and deeds inscribed as an inspiration to those who follow. Martin Rønne's name is among them. The English blockade and German submarine warfare limited all shipping, particularly that of neutral nations in northern Europe. In spite of the hazardous situation, Amundsen proceeded to build a new ship, the MAUD, named for the late Queen Maud of Norway, who along with King Haakon and Crown Prince Olav V, had supported Amundsen in all of this polar expeditions. Most of Amundsen's equipment and outfittings were obtained from the United States, including food, which was strictly rationed in Europe. Fresh from the shipyard in July 1918, the MAUD sailed northward along the Norwegian inland waterway of the rugged island-studded coast, then eastward across the Kara Sea. Amundsen planned to follow Nansen's 1893 route by steaming east along the coast of Siberia to the New Siberia Islands, and beyond, hoping to enter the North Polar current. This current enters the polar basin through the Bearing Strait, crosses the North Pole area and continues south until it enters the North Atlantic Ocean. MAUD had rough and slow going through the ice choked waters. By the time Cape Tscheljuskin, the northernmost mainland point in the world, was reached, the oncoming winter weather slowed the ship's progress. Newly frozen ice soon had the MAUD encased in its grip. Here, the ten men spent their first winter. It was a bleak and lonely area where the nearest inhabitants were more than a thousand miles away. Upon the sun's return in April, sledge journeys were made northward and new geographical discoveries were added to the scanty map coverage of this area. It was seen only once before, in 1897, when the Swedish explorer Otto Nordenskjold passed here on his first discovery of the North-East Passage. When open leads started to form in the pack-ice, the MAUD moved slowly eastward where further attempts to enter the transpolar current proved futile. Martin Rønne recorded in his diary that the situation looked hopeless, when, instead of going north, the current was carrying the ship south to the Siberian coast. Shelter from the oncoming winter storms and darkness was found in the lea of Ajon Island in the Lena River delta, where the MAUD again was frozen into the ice. In contrast to the first winter, the men had a more enjoyable time. They were a closely knit group. Five of the eleven had been on the South Pole expedition. Now they were trying their skills at the opposite end of the earth, where unrelenting forces of nature had prevented them from reaching their objective. The Siberian natives, called the “Shucksers”, were living nearby and were frequent visitors to the ship. Dr. Harold Sverdrup, the expedition scientist, spent nine months traveling and living with them in the high mountains, studying their primitive living conditions and behavior. When the sun returned the following Spring, the ice pressures on their ship slackened and new attempts were made to get into the ocean current to drift northward. However, the current continued to drift the MAUD southward, in the opposite direction of their heading. After two and a half years of struggle, Amundsen decided to return to civilization to replenish his supplies and equipment. Nome, Alaska was reached in the fall of 1920, at which time three of the veterans, including Martin Rønne, abandoned any further attempts to cross the polar basin. After one month, Martin got an answer for the three to get on the Victoria from Nome to Seattle. From Seattle he traveled by Pullman train across the U.S. to N. Y. By this time, aviation had made tremendous advances, and during their homeward journey across the continent, conversation centered around the possible use of airplanes in the “far north. Martin took the Norwegian-American Line to Norway, reaching Norway in August or September 1920. Meanwhile, with a new crew, the MAUD spent three additional years in the ice after Martin left, studying the complicated ocean currents in those northern waters. In 1924, the Maud came back to Nome and onto Seattle, where she was sold for a fishing vessel, because Amundsen had no money. Wisting and Sverdrup were still head of the MAUD until she was sold. Martin Rønne, who had been on leave from the Norwegian Navy all these years, now went on the retired list. Over the years, Martin's light humor and congenial personality had been a great asset in the confined quarters aboard ship and in the isolation of the polar regions. The small house in Horten over-flowed with his many friends. A humorous prank, an after-dinner drink, and a good cigar on special occasions were his chief source of contentment. He was a good conversationalist and his many interesting stories were sprinkled with experiences told with a phenomenal memory for the smallest detail. In such fashion, Martin expected to enjoy many future years of leisure. Again, fate decreed it otherwise . . .
By now Amundsen was completely convinced that further exploration of the polar regions would be accomplished from the air. When Amundsen was in New York while lecturing in the U.S., he stopped at the Waldorf Astoria Hotel. When the telephone rang, he answered it in a sour voice. On the other end was Lincoln Ellsworth, a privately wealthy man. Lincoln Ellsworth who asked to speak to him of his interest in Arctic and Antarctic exploration. Amundsen asked him to come up to his room and in the ensuing conversation, Ellsworth expressed his great interest in Amundsen, and his work in the Arctic and Antarctic. Ellsworth offered Amundsen money for a future expedition so long as he could accompany him. Amundsen had the ideas and experience and Ellsworth had the money, a most perfect combination. To Amundsen, Ellsworth was a God send! It took several years for Amundsen and Ellsworth to plan their expedition which called for flying two planes to the North Pole and landing there, one to be headed by Amundsen, the other by Ellsworth. In 1925, when they headed for Spitsbergen with two amphibious airplanes, Martin Rønne once more was a member of the staff. At Kings Bay, 600 miles from the North Pole, weeks were spent preparing the two planes, and additional weeks in waiting for suitable weather to begin the dangerous flight over the polar ice-pack. He should have gone along, but age prevented Martin Rønne from being included in the crew and he proved to be too heavy for the allowable weight to be carried by the plane. But his qualifications were utilized in making certain the equipment was the best and that nothing was missing from their essential requirements. He made a small collapsible canvas-covered boat that he later patented for the two planes which proved extremely valuable later in the flight-crew’s struggle to save their lives, as they went back and forth between the icefloes carrying gas, oil, and food between the downed planes. While the days waiting for good weather dragged on with little for the men to do, Rønne decided to make a gift for his friend of many years. Taking the bayonet from a rifle, he fashioned a beautiful knife with a sheath and carrying strap and proudly presented it to Amundsen during a cozy hour in their wardroom at Kings Bay. Amundsen was most appreciative and mentioned that it may come in handy on his flight. At the latter's suggestion, Rønne placed the knife in Amundsen's flight bag and thought no more about it. Later, when it became necessary to reduce the weight load in the two planes, Rønne noticed that Amundsen had put the knife among the things that were to be left behind. Without his knowing it, Rønne put the knife back in the bottom of Amundsen’s flight bag, hoping it would not be discovered until after they had taken off. This knife fortuitously proved to be the one implement that saved the lives of the men from certain death in the Arctic sea. Martin was the last man to give Amundsen a handshake before he stepped into the plane on the Amundsen-Ellsworth expedition when the weather cleared and on May 21, 1925, the two planes, with three men in each, took off from Kings Bay and headed for the North Pole. Believing they had reached the pole, both planes independently decided to land in a wide open water lead in the pack ice. Floating pieces of ice damaged both planes in the landing. In dragging one of the planes onto the ice-floes, it was wrecked beyond repair. Although they landed only three miles apart, neither knew where the other was. They had no radio communication. However, both parties soon learned they were 147 miles short of their goal. Strong head-winds had prevented them from attaining the anticipated ground speed. While surveying the surrounding area, the two crews found one another and planned to return in the one remaining plane. First they would have to carve out a runway from the uneven sastrugi strewn surface. Their leveling equipment, shovels and ice-axes, proved disastrously inadequate, until a thorough search of the plane revealed the knife Martin Rønne had made and stowed away in his leader's flight bag. The men labored almost a month to get the runway in shape. By securing the knife to a ski pole, it became the most efficient ice-cutting tool they had. Later, Amundsen stated that without it, it would have been doubtful if they could have readied the strip in time. By now the world was convinced all six men in both planes had been swallowed by the mysterious, unknown polar sea. One of the two tents Martin made for the expedition was left at their camp site at 88 degrees North. With the improved runway, the six men finally were able to take off in one plane and return to Kings Bay, where they received a tumultuous welcome. It had been a very close call. Amundsen was crowding his luck, as yet, it had not forsaken him. Lincoln Ellsworth’s father, James W. Ellsworth, a multi-millionaire from coal mining in Pennsylvania, died thinking his son had perished in the Arctic and left all of his money to Lincoln’s sister, Claire. Fortunately, the two were close so she willingly shared the fortune and adhered to what she knew would have been her father’s wishes. Amundsen was not the man to give up easily. He acquired a small dirigible, named NORGE, and set up camp at Kings Bay again the following year (1926). Martin Rønne again was an integral part of the supporting force. A few days later, the NORGE became the first lighter-than-air craft to cover the entire polar basin from one end to the other. With Amundsen, Lincoln Ellsworth, and Umberto Nobile on board (the latter being the NORGE'S original designer and engineer), they crossed over the North Pole, headed toward Point Barrow, and after a hazardous journey eventually landed at Teller, Alaska - to world acclaim. But Amundsen's luck had finally given out. In 1928, he hurriedly took off from Northern Norway in a French plane and headed for Spitsbergen in search of Nobile (a man of whom he was not fond), who had crashed his airship ITALIA (the renamed NORGE) in the polar sea. Nobile was rescued some weeks later, unharmed, but Amundsen was never heard from again. Some years later, a float and other debris were found off the coast indicating the plane must have dived into the water, killing all three onboard instantly. Aviation had pioneered its way through polar skies, but one of its meteor's had made his last descent. Martin Rønne was greatly saddened by the tragic death of the great explorer with whom he had been a friend and associate for 20 years. He was now getting along in years himself and definitely decided this time he would enjoy his retirement. Already too much of his life had been spent in the polar vastness, far away from his family and home. But, once again this was not to be! Before Amundsen had departed on his fateful mission, American Commander Richard Byrd had requested him to recommend a Norwegian he would like to have as an advisor on his forthcoming Antarctic expedition. Amundsen and Byrd had met in Spitsbergen in 1926, when Byrd, on his ship the CHANTICLIER, arrived to make a flight toward the North Pole with his pilot Floyd Bennett. Amundsen immediately responded that if he were fortunate to secure the services of Martin Rønne, he would have an excellent man. Rønne turned down the offers Byrd made in the first two cables Byrd send him, although the second had considerably increased the remuneration. The third cable proved too great a temptation. Martin thought it over for some time, discussed it with his long suffering wife, and as he said later, “My gosh! With a salary like that, I would be a fool not to take it!" Rønne crossed the Atlantic on the Norwegian whaling ship, C.A. LARSEN, to Norfolk, Virginia, where other members of the expedition came onboard. For the voyage to New Zealand, they were joined by two other ships and from Wellington, the expedition headed south. Byrd's camp, named “Little America,” was set up four miles from FRAMHEIM, Amundsen's old winter quarters in the Bay of Whales. After eighteen years, Rønne, who was a very sentimental man, had returned to an environment which brought back countless memories. He recognized Mt. Neilson and Mt. Ronniken, but the buildings Amundsen set up could not be located. Heavy snow-drifts over the years had buried FRAMHEIM deep in the barrier. Martin Rønne spent his 68th birthday while wintering at Little America and was the only man on the First Byrd Expedition who had ever been to the Antarctic before, including Byrd. Living and working along with 42 other men, he completed the sledging equipment, tents, sleeping bags, and clothing that the field parties required for their sledge trips into the unknown. The winter night passed quickly and in his spare time he made a model of their flagship, the CITY OF NEW YORK, which he presented to Byrd as a memento from an old sailor whose devotion to duty was something out of the ordinary. In 1933, this model was exhibited onboard the "CITY" at the Century of Progress exhibition in Chicago. At the time Byrd, was offered three thousand dollars for it but rejected the offer. Byrd valued Rønne's work and in the years that followed often exhibited the model with great pride, expressing his admiration in the most glowing terms. Upon his return to Norway in 1930, Martin enjoyed the life he had dreamed of for many years. Model ship-building had been his hobby since he first went to sea. He acquired an artistic touch for that ancient Mariners handicraft that occupied much of his spare time. Today, his ship models can be found in many private collections throughout the world. One of Martin Rønne's proudest moments was when he presented King Haakon with a replica of the silken tent that Amundsen left behind to mark the exact spot of the South Pole. He continued traveling through the Scandinavian countries visiting his children and grandchildren until his death in May 1932, at the age of 71 years. He lays buried in a small cemetery in Horten, the town he called home. His wife, Maren Gulicksen, died four years later. This is absolutely confidential. I am willing to write you concerning it, because I know I can trust you. I am contemplating another Expedition which will leave this country either the first of next October, or October 1932. This expedition will not last more than five months, tho I can make no promises about that. This I want to make clear. The idea would be to have a powerful icebreaker of about 8000 tons horsepower, instead of 200 as we had in the CITY OF NEW YORK. We can then get thru to the Antarctic Continent early in the season and would not have to spend the winter night. We could remain until late in the season. The ship would be of three or four thousand tons, and comfortable. I want to find out if you will want to go with me again. If I can possibly avoid it, there will not be volunteers this time. The pay will perhaps not be much but it will be fair, I hope, and of course, you would be getting your board and lodging the whole time you are with me. Please let me hear from you at once. Mark your reply to me ‘personal and confidential’. Please do not discuss or write anyone about this - with no one - without exception. The very best regard to The Admiral and his family from my wife and myself. Please make up from the Burberry Garbardi cloth (the kind that Amundsen used) a wind proof parka and pants and send them over to me so I can decide whether or not to use the kind of cloth you suggest. Please do this as soon as you can. After you have done this, will you please make up one of the tents that you made for Gould for his use on the trail? Make it out of the same cloth. But please make the parka and pants first. We will probably not leave until next September and you could perhaps come over on one of the whalers. But we will see how things turn out. We may want you sooner than that. If the tents and parkas you make are O.K. you could be working on them during the winter. I note what you say about the shoes and will let you know about this later on. I believe I would have reindeer skin sleeping bags. They are warmer than dog skin. I also note what you say about Hans Bull. Give my regards to him. I have seen a good deal of Johansen, Strom, Balchen and Petersen and they send their regards. I have your letter and the suit which arrived yesterday. I think our meterial over here is better for reasons which I can explain to you when I see you. I will attempt to send some of this material over to you. You could make up some parkas provided it is not too expensive. Please let me know what you would charge for making parkas. We have collected about forty tons of different materials and hope to get off next October. I will not put the personnel on ship until several weeks before departure. Do not do anything about the tent. That can also wait until we get the material in this country. It is the same as we used before. I think the Norweigian (sic) material from which you made the parka is a little too heavy. “written” I’m enclosing a check for the material. 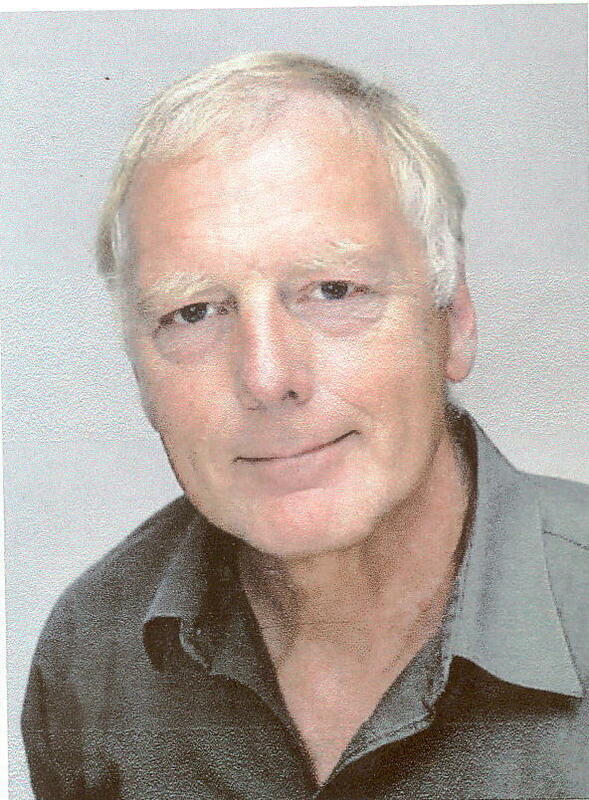 “The quality of his contribution to the expedition was extraordinary. In all of my experience I have never seen a greater devotion to duty. He also possessed unusual efficiency. He is perhaps the greatest expert among the white race in the designing and making of polar clothing. Some men possess a sixth sense, the ability to predict future events with a certain degree of accuracy. Martin Rønne had such a talent. He had known that Amundsen would achieve the South Pole and find his message of congratulations, and he had foreseen that the knife he had presented Amundsen at Spitsbergen would come in handy on the North Pole venture. In his twilight years, he made his final long range prediction about a son following in his footsteps, which astounded his son Finn for the rest of his life. When Martin died suddenly in 1932, Byrd offered Martin's son, Finn, the vacancy his father had left. Finn who had emigrated to the United States and was an engineer with Westinghouse, accepted Byrd's offer as a dog driver and ski expert, thus launching his own long and illustrious polar career. Of five sons, why had Martin written Finn's name in preference to one of the others who, at the time, might have been more likely to follow in his footsteps as an explorer? “The old man must have known I would come," murmured Finn. Martin’s old bunk became Finn's, but to his chagrin, Finn soon found out it was the coldest spot in the entire settlement. At night when the door was kept open for ventilation, the cold raw air, at times in the lower sixties below zero, blew right into his bunk. Martin had predicted well! Finn continued in his father’s polar path. He made nine expeditions to the Antarctic. Four of them were wintering ventures for more than a year's duration, including his own 1946-48 scientific and geographic expedition, RARE. On it, I became the first American woman to set foot on the shores of the Antarctic continent and the third member of the Rønne/Ronne family to spend a year there. Such was the legacy of Martin Richard Rønne. 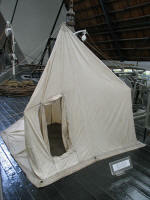 Tent made by Martin Rønne, replica of the one Rønne made for the expedition that was left at the South Pole by Roald Amundsen in 1911. Ronne Entrance (72°30′S 74°0′W) is a broad southwest entrance of the George VI Sound where it opens on Bellingshausen Sea at the southwest side of Alexander Island. It was discovered on a sledge journey through the sound in December 1940 by Finn Ronne and Carl Eklund of the US Antarctic Service (USAS), 1939-41, and named "Ronne Bay". Since 1940, the head of the bay has receded eastward into George VI Sound, altering the relationships on which the name was based. The name was therefore changed to Ronne Entrance, in keeping with the physical characteristics of the feature. Named after the Ronne family, of which the father, Martin Rønne, was a member of the Norwegian expedition under Amundsen, 1910-12, and the Byrd Antarctic Expedition 1928-30; the son, Finn Ronne (d.1980), was a member of the Byrd II Antarctic Expedition, 1933-35, and the USAS, 1939-41 and the Ronne Antarctic Research Expedition, 1946-48.